Stewardship Pledge Drive 2019 is here! Building on the visibility of our 325 year celebration, the events we have sponsored have invited increasingly broader audiences to experience the ministries we have to offer. Voices On the Green has developed an established audience that partner with us to support social justice work. The two outstanding musical events, Missa Gaia and Jams for Justice engaged the audience into a deeper understanding of the change we would like to see in the world. Over the last few months, by making our building space available, we have developed partnerships with community groups, like LexRap and Minuteman Indivisible, to support their mission and support their leadership. Expanding our existing partnership with LYFS by offering a Friday drop-in for LBGTQ. Association of Black Citizens of Lexington: we provide monthly meeting space for the teenagers to gather, watch movies in celebration of black culture, and grow together. Lexington Says Enough: offering a meeting space for the student group that works on behalf of reforming gun control laws. Minuteman Indivisible: with FP members in leadership positions, we have offered free space for book studies, voting drives, meetings to support voter’s rights and democratic practices. LexRap: by building on our existing relationship, we are supporting their new initiative, “Hand in Hand”, a community meals program that brings people together for tableside discussion and helps the refugee women support their families. Last year, during the Imagination Cafes we shared our dreams for First Parish to do important work in the world. We need to invest in those dreams with resources. We need to support our staff and programs financially to enable the amazing new ideas we imagined for our community. The last six months have already shown promising returns with increased attendance during the Summer services, on Sunday mornings and the RE programs this fall, and for our monthly community wide events. We expect members and long-time friends (non-members) to pledge. We also welcome pledges from the wider community. Pledge cards will be mailed in early March. On Celebration Sunday, March 10, please bring your card to the Sunday service at church or pledge online. 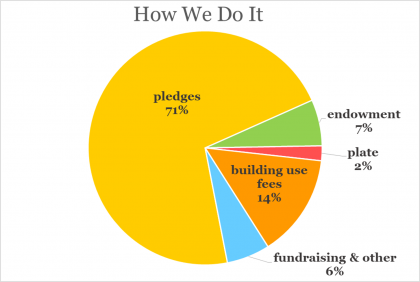 What is the pledge drive? How much should I pledge? Please visit our FAQ page to see valuable information about making your pledge. The amount you pledge of course depends on your household’s financial situation. Following guidelines for churches like ours, we encourage active and committed donors to pledge at least $3,000, moderated by financial situation. We are encouraging every family to consider joining the 10 families who raised their pledge last year to $3000 to maintain the financial foundation First Parish relies on. The programmi ng and the operations of our congregation is funded mainly by the commitment of our members and friends. 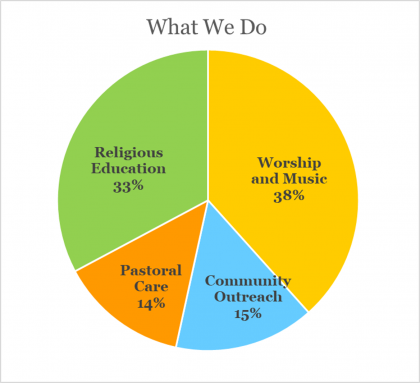 Although we are always looking for new ways to fund our upcoming initiatives, community events, and expanded programming, the support of the church community is the foundation of the annual budget. As our circle of community widens, we hope that we will be able to create more opportunities to serve, to broaden the access to our programming, and to expand the reach our prophetic voice. Dedication to justice and the search for truth and meaning is needed more than ever. Join our worship service on March 10th to hand in a pledge card or pledge online! Who is driving the Stewardship Pledge Drive this year? Contact the Stewardship Planning Team by sending email to stewardship@fplex.org.